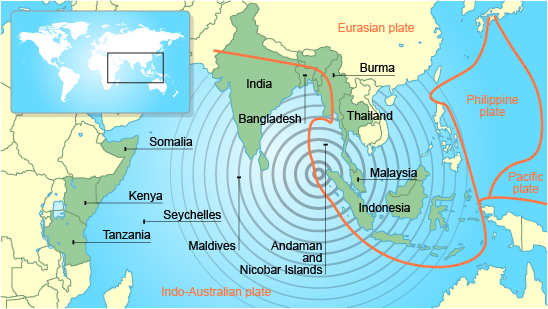 On 26 December 2004 a tsunami occurred in the Indian Ocean. It was the result of the Indio-Australian Plate subducting below the Eurasian Plate. It was caused by an earthquake measuring more than magnitude 9. The earthquake caused the seafloor to uplift, displacing the seawater above. In open ocean the tsunami measured less than 1 metre high. The tsunami travelled at speeds up to 800km per hour. When the Tsunami reached the shores, the height of the wave increased to 15 metres in some areas. A quarter of a million people died. Two million people were made homeless. People were swept away in the waters, which arrived rapidly and with little warning. Thirteen countries were affected, the worst being Indonesia. Indonesia was hit by the tsunami first. Fourty-five minutes later the tsunami reached Thailand. Mangrove swamps helped to act as a barrier to reduce the energy of the water in some areas. Short-term aid, such as water purification tablets, temporary housing and medical supplies were given from international countries. Islands reliant on tourism and fishing, such as the Maldives, had to rebuild their industries. An early warning system between countries surrounding the Indian Ocean has been set up.